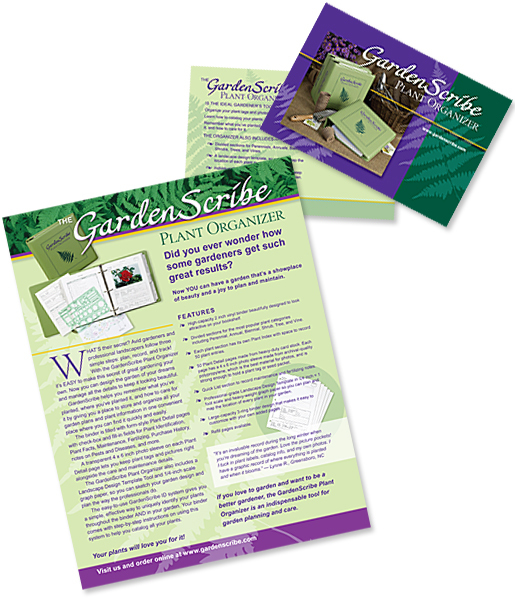 For the folks from the GardenScribe Plant Organizer, we’ve created designs for their web site as well as their printed materials. We also do display ads for them on an ongoing basis. Working with professional photography provided to us, and a unified visual approach to all materials, from the cover of the product binder itself to the images on these promotional pieces, all materials representing GardenScribe, including the product itself, have a cohesive, coherent look, and the message about this great product line is consistent wherever it appears.